(Zion National Park, Utah, April 18, 2012) According to geologist Keith Norlin, the top of the Grand Canyon is the floor of Zion, and the top of Zion is the floor of Bryce. 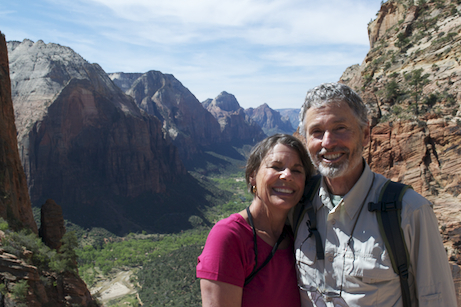 Today, we hiked Zion’s most famous trail from the floor to nearly the top. It’s a strenuous trek, and we start at 10 am. 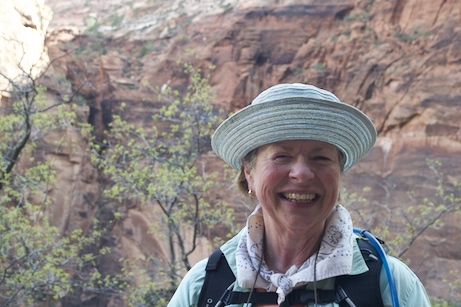 Gradually, the trail steepens until we arrive at Walter’s Wiggles, a series of 21 switchbacks named after Walter Ruesh, Zion’s first superintendent. 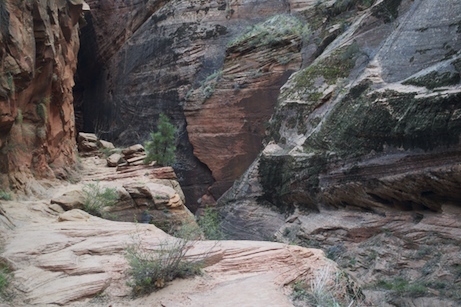 The switchbacks lead to Scout Lookout, with amazing views below into the canyon, where the Virgin River flows through a plain that eventually narrows upstream to steep cliff banks that force hikers into the water. It’s April; we won’t venture there. 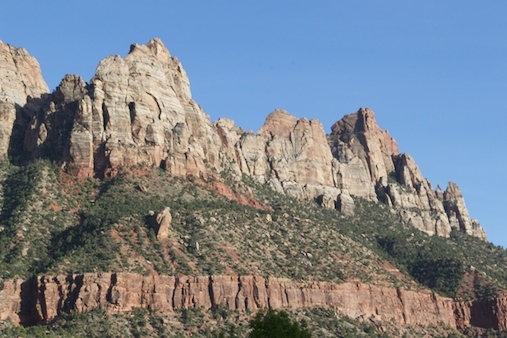 Zion’s peaks tower above us along the way, red, jagged, and beautiful. 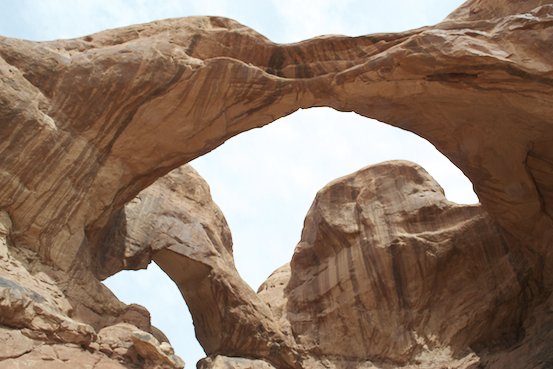 They have names like Cathedral Mountain, the Three Patriarchs (Abraham, Isaac, and Jacob), and the Great White Throne. It’s hard not to be inspired by them, or to understand why the park’s founders gave the mountains these names as we enjoy the fruits of our labors at Scout Lookout. 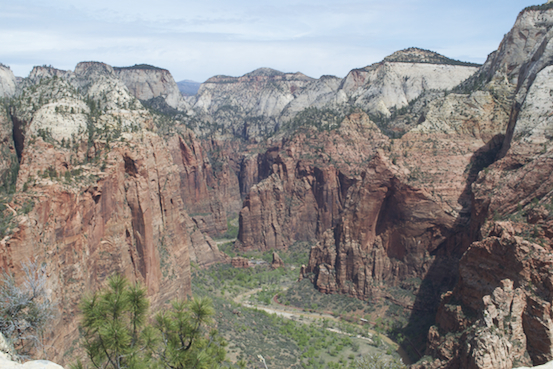 But Angel’s Landing Trail doesn’t end there; it continues up a dizzying, narrow path with steep drop-offs on both sides, with a chain to grab for dear life on the way up and down. A few of us made the white-knuckle decision to head for the top. Note that while this blog includes images from there, it does not include any visual reference to the chains. Thank you for not asking me why. The afternoon continued with a short walk along Lower Emerald Pool Trail, with great views of a waterfall, the first of three pools, and, of course, more geological insights that could only be learned via the combination of Zion’s spectacular rock formations and a professional geologist alongside to answer questions. Road Scholar has taught me more about this subject in 48 hours than I learned in my entire life. After dinner, falconer Martin Tyner delivered a presentation on Zion’s birds of prey, complete with his co-presenters Thumper the hawk, and an anonymous but beautiful golden eagle. A grand first day ends with the added satisfaction of knowing that tomorrow will bring more strenuous and rewarding adventures. 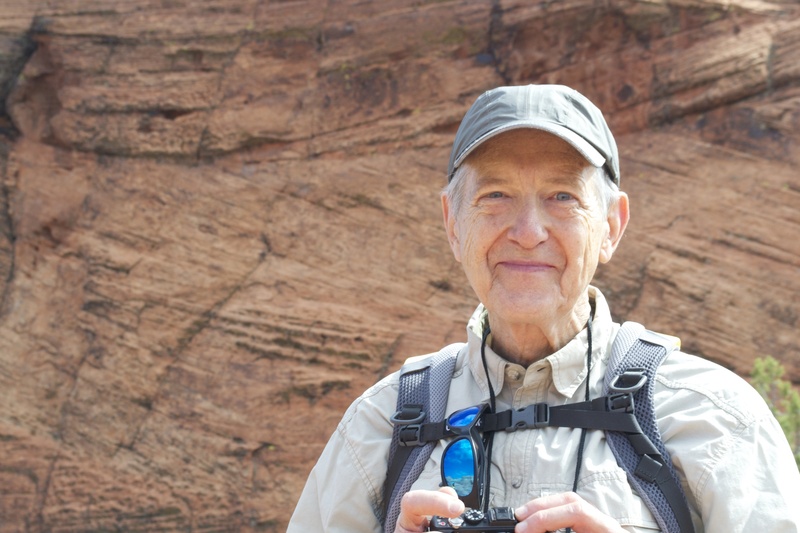 Ed Camp, retired banker and avid bicyclist, on the Snow Canyon Trail. Not surprisingly, all of us pass the test. And so does our destination. Snow Canyon is beautiful, and our short hike leads us to a peak with great views in all directions, and all kinds of rocks to identify. Best of all, we get a chance to meet each other along the way, and learn where we call home and what we do when we’re not exploring the world with Road Scholar. It’s a great afternoon, with even greater promise of what’s to come. 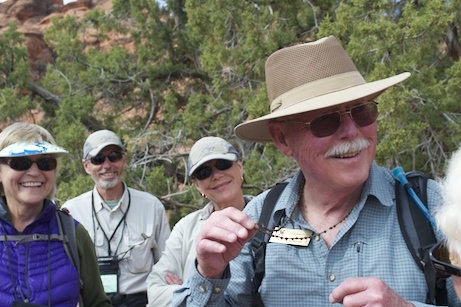 Geologist Keith Norlin shows us his beads. A highlight is Keith Norlin’s brief departure from his geology curriculum to describe his ghost beads, given to him by local Native Americans to ward off evil spirits. 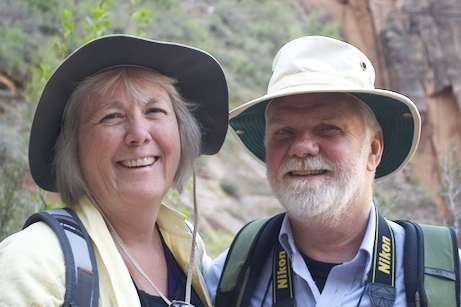 So far, they’ve worked well for him, and, thanks to Marcia’s invocation of the “all in” rule, they have been enlisted in making sure our week in Zion and Bryce Canyon will be spectacular. 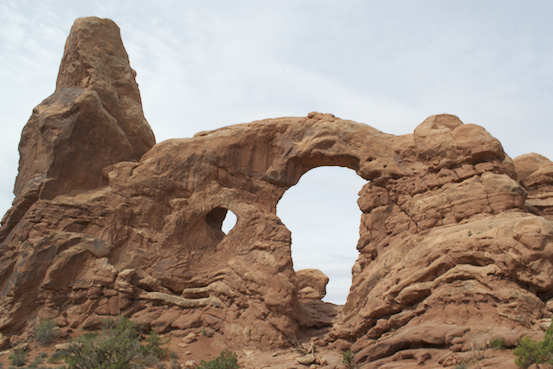 (St. George, Utah, April 18, 2012) The people of the Southwest live with nature in their backyard. A weather forecast of “partly cloudy with a chance of showers” back in Boston might prompt us to bring an umbrella. 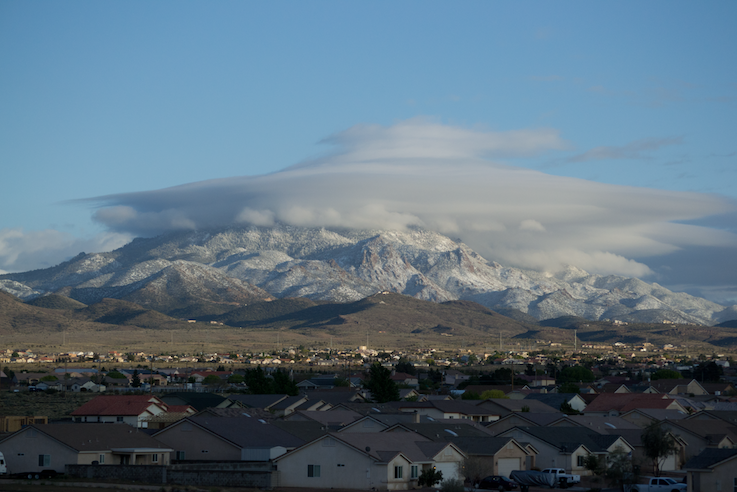 Here, open skies and nearby mountains can put on quite a show. Small rain showers race across the landscape, while bigger clouds hover over the peaks, bringing snow in April or even May. 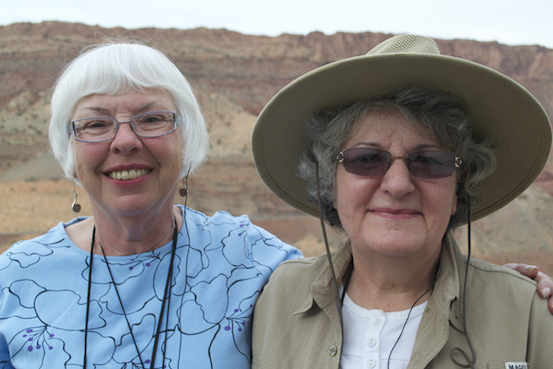 With our fellow Road Scholars, we make our way to St. George, Utah, where our journey to Zion and Bryce Canyon will begin. 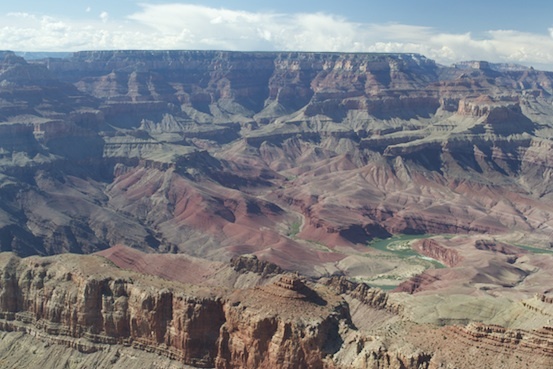 It’s a short drive from Las Vegas, but we take the long way, through Flagstaff, Arizona, and the South Rim of the Grand Canyon. The extra miles pay dividends in spectacular views, made even more dramatic by the fresh snow. 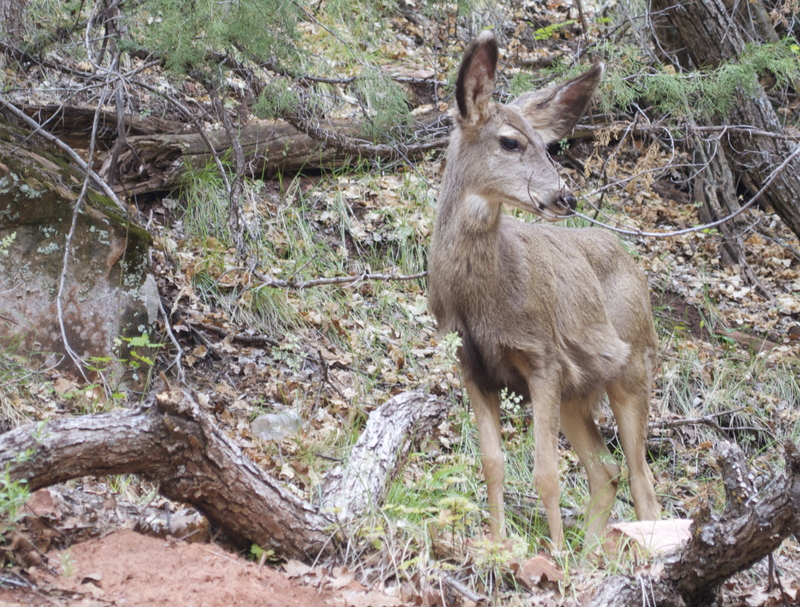 Several other hikers we meet in St. George agree. St. George is a gem. 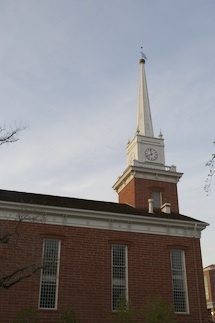 Founded in 1861, it’s modeled after a New England town. The Historic District looks just like one, built with red sandstone. 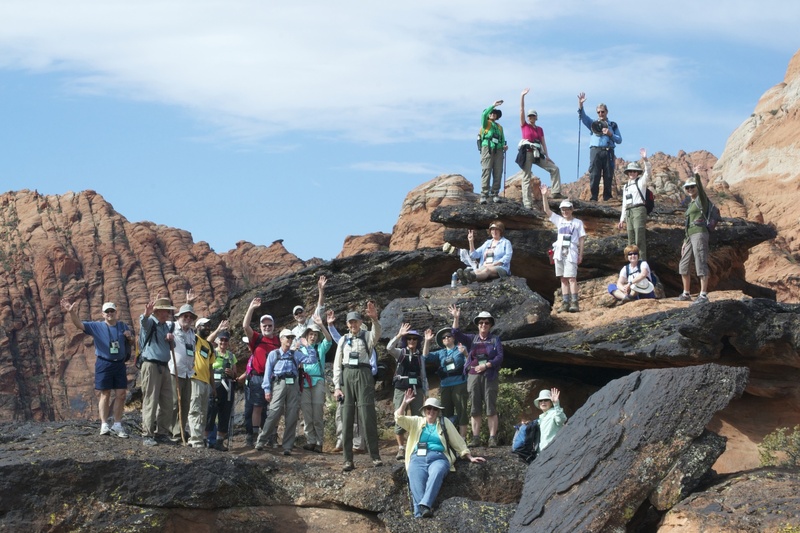 Our headquarters, Dixie State College, is home to 80 Road Scholar programs this year. 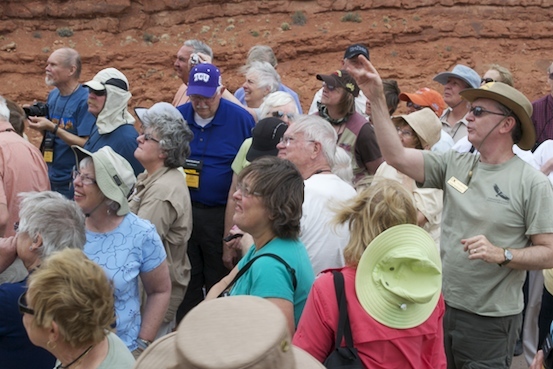 Program Leader Marcia Cooper has a joke for all occasions, and Geologist Keith Norlin starts our day with a lecture on how the lands we will trek formed over the ages. 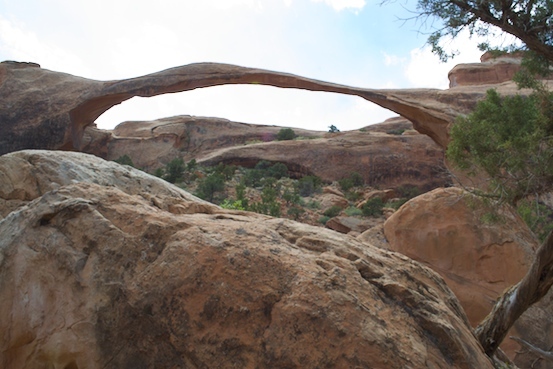 His “Ages of Rocks” list ends with a cross-section of the scenery we will enjoy for the rest of the program. Nice. Douglas Alder as Erastus Snow. 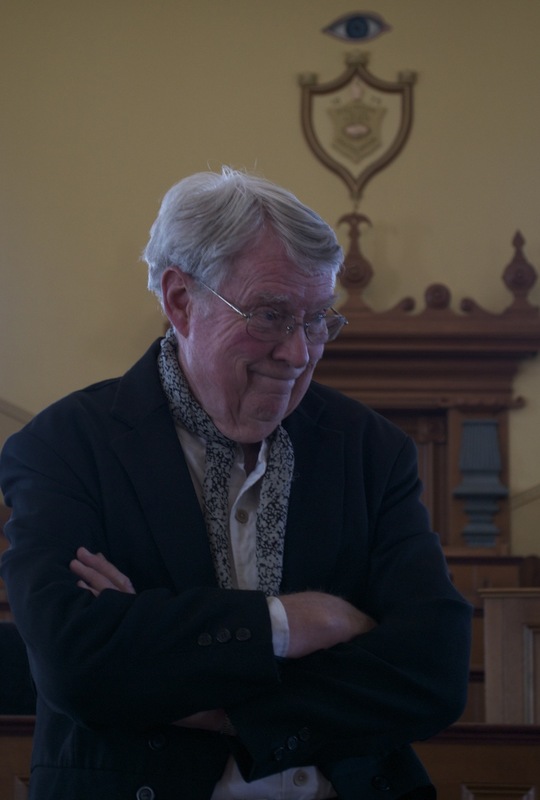 Professor Douglas Alder, former President of Dixie State, follows with a rousing history of the town, including a performance inside the St. George Tabernacle as Erastus Snow, who helped found St. George in 1861. Later in our tour of the city, he channels Judge John MacFarlane, and presides over an 1880 trial of a local water thief, generously portrayed by participant John MacFarlane (no relation). 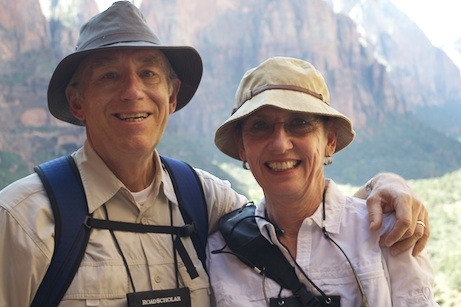 But above all the charms of St. George, Dixie State, and our Road Scholar hosts, the canyons of Zion and Bryce beckon. We are all eager to get there. 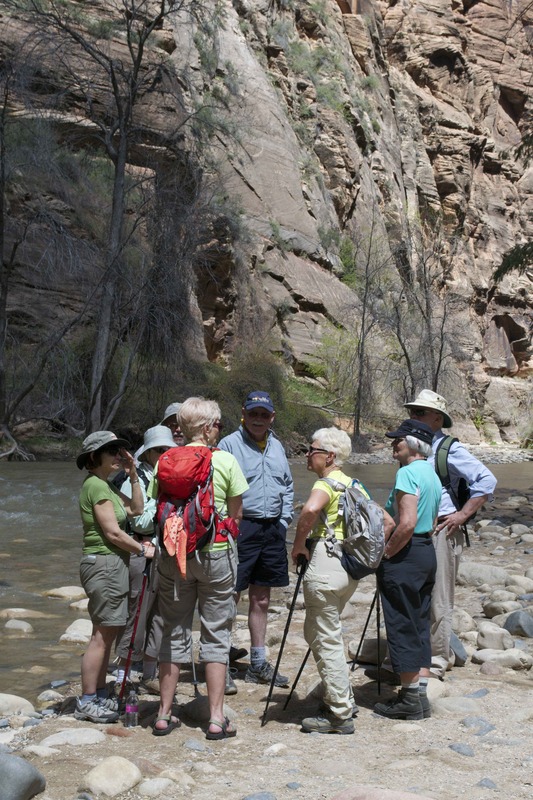 “If you are old, go to Zion by all means, but if you are young, stay away until you grow older…It is not well to dull one’s capacity for enjoyment by seeing the finest first.” – Henry Gannett, US Geological Survey (1846-1914).